I was in the middle of making out my grocery list this morning when Jenna sent me a message and asked me if we could watch Amara for a couple of hours while she went to visit her Dad. I’ve told you before that going to the grocery store with Amara is so much more fun than going alone so taking her with me was the first thing that came to mind. We had a blast! 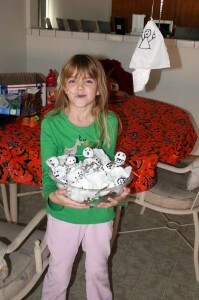 I was also thinking that maybe she and I could make the Lollipop Ghosts that Grandma Lizzie and written about a few days ago on her blog. I didn’t want to tell Amara about them and then have her be disappointed if we couldn’t do them so I just put Tootsie Roll Pops on the list and figured if they had them we would make them. They had them! I still didn’t tell her what I was up to. I wanted a chance to put the groceries away. I think she thought I was just getting them to give away to the Trick-or-Treaters. She had gone outside to swing while I put the groceries away. When I got done I just sat down at the table and started to make the first one. I soon found her standing next to me watching what I was doing. Then she took over making them. I already had silver ribbon so I decided to use that. I did the ribbon cutting and curling and she did everything else. We had such a good time! She made a point of thanking me for making them with her. I told her it was Grandma Lizzie’s idea! FYI — Amara’s lips are blue because there was a blue open Tootsie Roll Pop in the bag. I thought it should go in my mouth but you can tell who won! 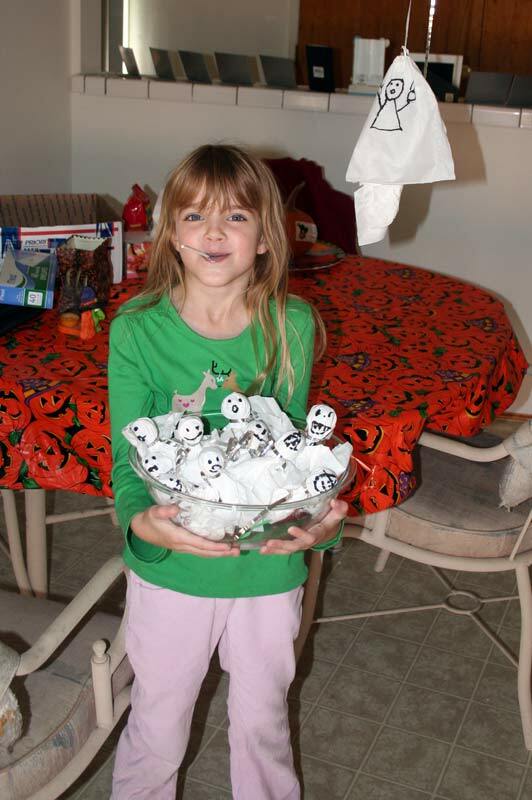 This memory was posted in Backyard Fun, Grandparents, Indoor Fun and tagged Amara, babysitting, backyard, blue mouth, ghosts, goblins, Grandma, Halloween, lolipop ghosts, Mommy on October 31, 2010 by Grandma Kc. Your lollipops turned out great and the faces are darling. It looks like you and Amara had lots of fun making them. Thanks for sharing my idea. That is a really cute idea! Your ghosts turned out great! – such cute little faces! Good job Marzie!! They look great. We did the same thing only they got ate by all the grandchildren before I could get a chance to take a picture. Great ghosts! I did the same thing (inspired by Lizzie’s post) for my grandson. I mailed a few ghosts with Halloween books and he was thrilled. The sweet and silly ghosts helped him get over being afraid of the the spooky ones (he’s only two and a half). Love your site. Amara seems a special little gal! Thanks Lisa, Amara really is very special! And I am so lucky that she only lives one short mile away. Blogging about our grandkids is sure a great way to spend our time. I really enjoy your site, too! Besides enjoying the cute story and pictures, I couldn’t help but note a technique you used. If I just sit down and start doing a project, little cherubs appear at my shoulder to watch, and then they ask to participate! Now, Amara wold have joined you anyway, but for some kids who like to think everything is their “own idea” this does work! 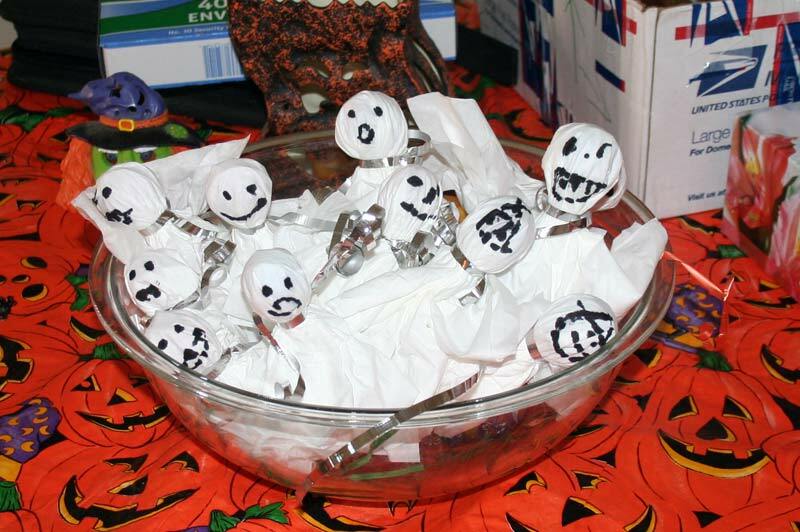 The Tootsie Roll pop ghosts are a cute idea. We may have to try those next weekend. You are like the best grandma ever…. :) I love reading your stories! 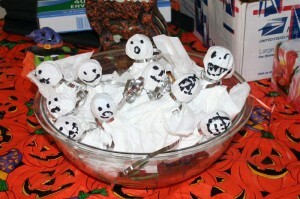 I’m going to make these with the kids then send some to my out of town grand kids! It’s so true, the kids always are interested in what you are doing and want to join in! Thanks for linking with me!